Review written by and copyright: Rick Curzon (31st January 2019). 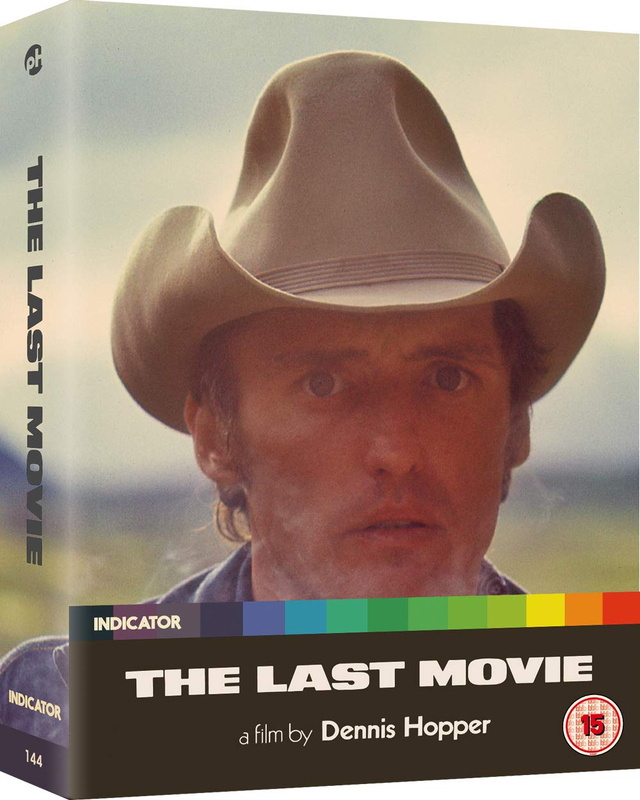 Dennis Hopper's legendary, long-unavailable masterpiece is available for the first time ever in the UK. Hopper followed the enormous international success of Easy Rider (1969) with this exuberant passion project - a delirious, free-wheeling epic production shot in Central America with an incredible cast (including Peter Fonda, Kris Kristofferson, Russ Tamblyn, Michelle Phillips, Tomas Milian and Sam Fuller) and an ambition to re-invent American cinema. Unseen for many years, this one-of-a-kind film can finally be experienced in a ravishing new 4K restoration. A stuntman (Dennis Hopper) stays behind in Peru after the film he is working on wraps the location. He shacks up with a local woman (Stella Garcia) and gets involved with a volatile friend (Don Gordon) in a scheme to exploit a gold mine. Meanwhile the locals start to imitate the various acts of moviemaking, only they don't understand that it's fake. Hopper's great folly; a non-linear, pretentious melodrama that looks fabulous throughout, has some great songs and uses it's locations very well. The acting is also of a high standard with special mention going to Garcia and Julie Adams as the two main women in Hopper's life; the latter as a middle aged American woman with strange sexual tastes. In his introduction Hopper describes this as a film with a beginning, a middle and an end ... only not in that order. Yup; that describes it very well. There's always something interesting on screen every few minutes so the longeurs don't last too long. Very much an arthouse film through and through; it's no wonder it was a critical and financial failure in it's day. A memorable production and a fascinating curio. This is one gorgeous looking film shot on stunning locations and the 2018 4K restoration does it justice. Easily one of the very best visually and aurally appointed films released by Powerhouse Films as part of their Indicator range. Hopper favours a rich, detailed naturalistic look throughout with a heavy, thick, appropriately grainy, filmic appearance from first frame too last; very obviously a well budgeted American film of the era. The colours heavily favour the warmer end of the spectrum with plenty of reds, yellows, oranges, greens and browns. Flesh tones are very natural and not overcooked. Black levels are rich, deep and with plenty of shadow detail. No signs of unintended crush anywhere. Contrast is perfectly judged ensuring that exteriors and well lit moments are bright but filled with detail and with no blown out highlights. Gamma bears no evidence of bias and seems perfectly balanced. Detail in closeups, medium shots and long shots is very satisfying. Textures in faces and fabrics are lifelike. There's no sign of age related damage or imperfections; whoever restored this film, loves it. No sign of digital tinkering either; massively film-like appearance throughout. Encoding is topnotch and then some; Mackenzie and Co. have obviously been inspired by this film and along with the earlier Night of the Demon (1957) limited edition we have a prime candidate for Blu-ray of the year. A rock-solid mono track that is as expertly crafted as the film with a superb balance between music dialogue and effects; you can tell that Hopper took his time crafting it. There's no distortions or signs of damage; this is from a new 4K restoration after all. Subtitles are defaulted for any non-English dialogue but there's also the ubiquitous and essential, English for the hearing impaired subs. Unique to the UK Blu-ray, this is another in the long, welcome line of screen talks recorded at the National Film Theatre. This one conducted by Derek Malcolm one of the UK's foremost film journalists for the last fifty years. Hopper is as is to be expected; on fine, witty, crazy form. He discusses several of his films and has plenty of hilarious anecdotes discussing his antics ... much to the amusement of the studio audience. Terrific intro from Hopper recorded some time before he died; the grand old man is on fine, laid back form and recounts briefly the history of the film and it's resurgent popularity. A collection of documentaries that celebrate Hopper and the film. All have been ported across from the US Blu-ray set. If you've seen documentaries by Alex Cox and Paul Joyce before then you know what to expect. Very informative and filled with interesting trivia and info. This was a troubled production in that it's release was stymied by Universal who didn't know what to do with such a blatantly uncommercial arthouse film like this. The final featurette is an interview with some of the locals who appeared in the film and proves most fascinating. Some behind the scenes footage shot on the set in Peru. Far too brief extract from a vintage videotaped TV programme in which Hopper was on the road promoting his then new film. Short split-screen piece that shows before and after the grading and cleanup process. Vintage promo piece probably created to show to potential backers and or distributors. Vintage and modern trailers; they make for a nice comparison with the latter playing up the film's newfound classic status, with the 1971 version being more hyperbolic. Decent, if brief, HD still gallery. Yowzas ... just yowzas! Another home run, bullseye from Powerhouse in their range of supplemental hard copy supplements. Powerhouse Films just keep knocking them out of the park on a monthly basis. Just when you think they couldn't possibly top the Night of the Demon, Hammer, Castle or Harryhausen sets along comes The Last Movie which has been harder to see that most (if not all) of the films in those sets. In terms of extras and various versions of the film, Night of the Demon (1957) can't quite be beat, but Hopper's film has been so hard to see on home video it equalises. The picture and sound are as good as can be in HD and shy of an UHD Blu-ray release we ain't gonna get it any better than this. The film itself is an arthouse experience and very much an acquired taste but it's the kind of intriguing keeper that will just improve on subsequent viewings.